With a sparkling silver coating, this glass globe reflects its surroundings beautifully and features a brilliant mirror finish. With hand-blown glass construction, this glass gazing ball may be used for multiple applications both indoors and out. The globe can be used with any gazing globe pedestal or stand (not included), or use own its own such as indoors as an accent piece in a bowl or basket. This fantastic Glass Gazing Mirror Ball comes in a 10" size, ready for use in your garden, home, or backyard patio. Lily's Home offers beautifully designed clocks, dishware, garden decorations, and more to add a touch of style to any home. Whether you're looking for a statement piece for your living room or looking for a way to add more color to your garden, Lily's Home has just what you're looking for! IDEAL FOR ANY LOCATION: The Glass Gazing Mirror Ball from Lily's Home is beautifully designed and may be used for multiple applications both indoors outdoors and in ponds, gardens, patios, or pools! Yes, they do float! DESIGNED TO USE WITH MOST PEDESTALS: While the pedestal is sold separately, the mirror ball has been designed to fit most standard sized pedestals for a uniquely beautiful display piece that should create a relaxing atmosphere. 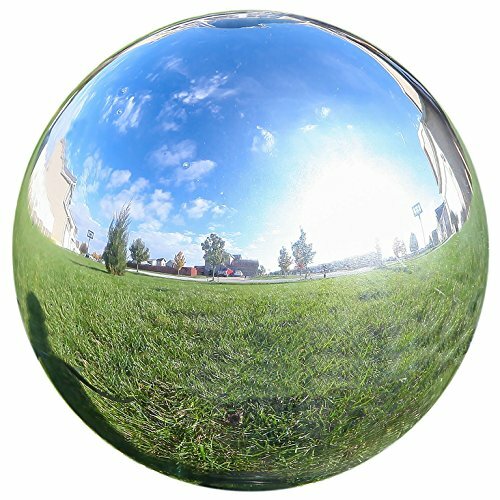 USE INDOORS OR OUTDOORS: The Glass Gazing Mirror Ball is made to hold up against the changing weather making it excellent for indoor and outdoor use! Create amazing focal points when used in your garden or in your home. BRILLIANT FINISH: The ball can also be used on its own such as indoors as an accent piece in a bowl or basket. Bring a touch of magic to your garden with this sparkling silver 10" Mirror Ball.